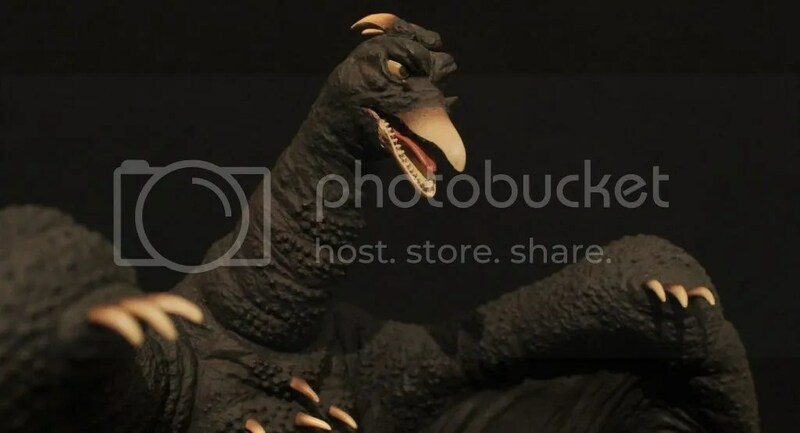 X-Plus 25cm Rodan 1964 | Fresh Vinyl HQ! In flies the X-Plus 25cm Rodan 1964! 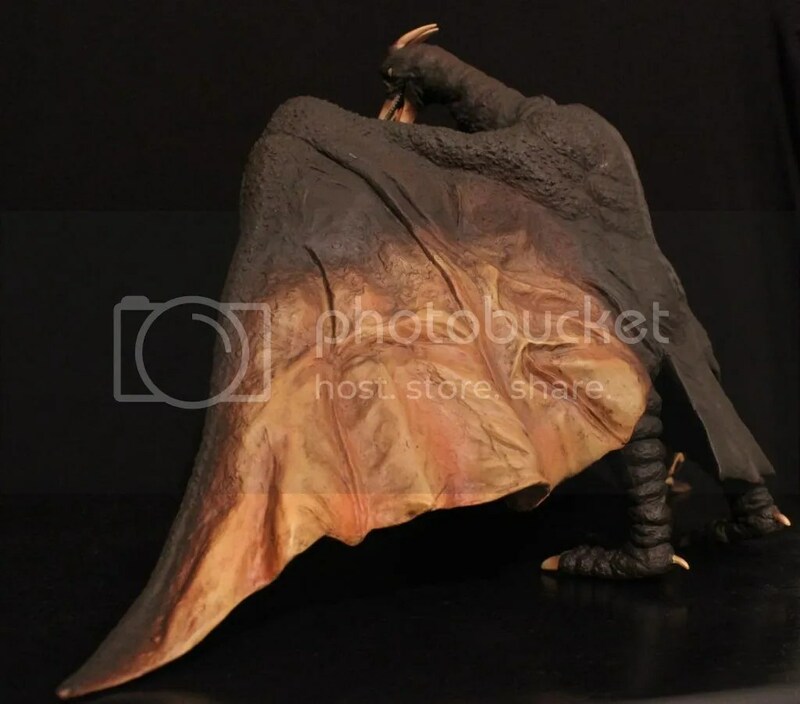 Released in February 2013, Rodan was packed in a white box with black print featuring a silhouette of Rodan on the cover. Just to discuss the box really quick, the box is not your typical style 25cm box. There is no see through window like the majority of the 25cm boxes. If you have the previously released Rodan 1956 or Adult Mothra 1961, the box is fashioned in the same manner. It is not the prettiest box but it was made that way for the protection of the figure and that is what matter most. S0 that is the box. Pretty simple. The figure itself is beautiful. The paint job and sculpt are top notch. DAMN FRESH! 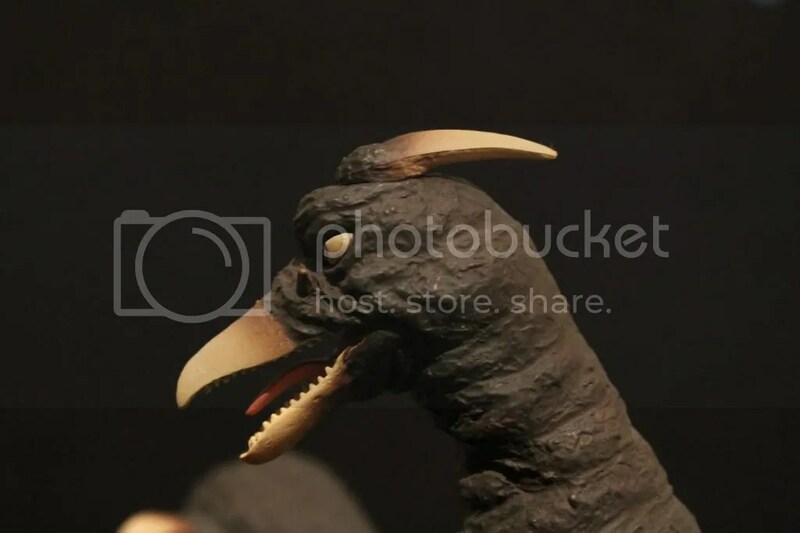 This figure perfectly captures the look of Rodan 64. 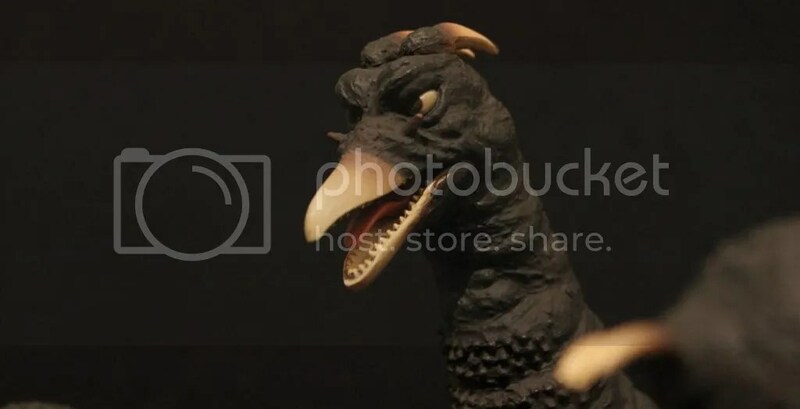 The look of Rodan is a major departure from the 1956 incarnation which was much more menacing looking. 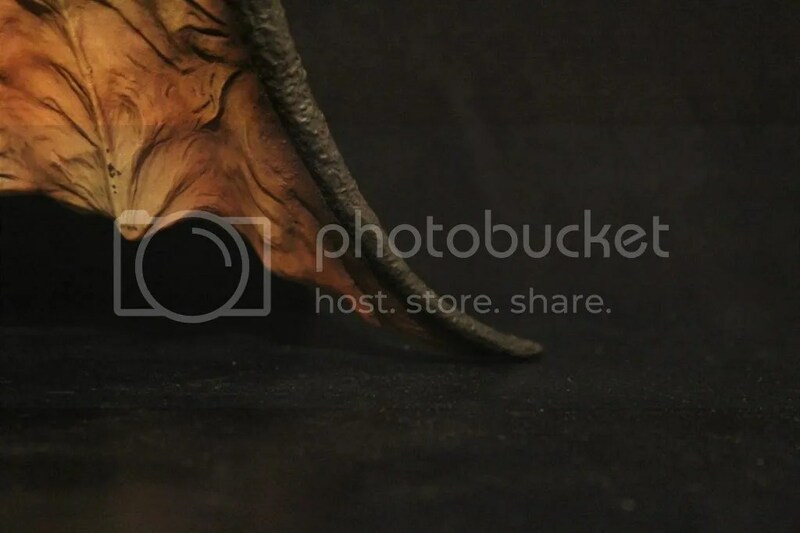 The new look for Rodan is friendly looking somewhat but mostly goofy looking too. 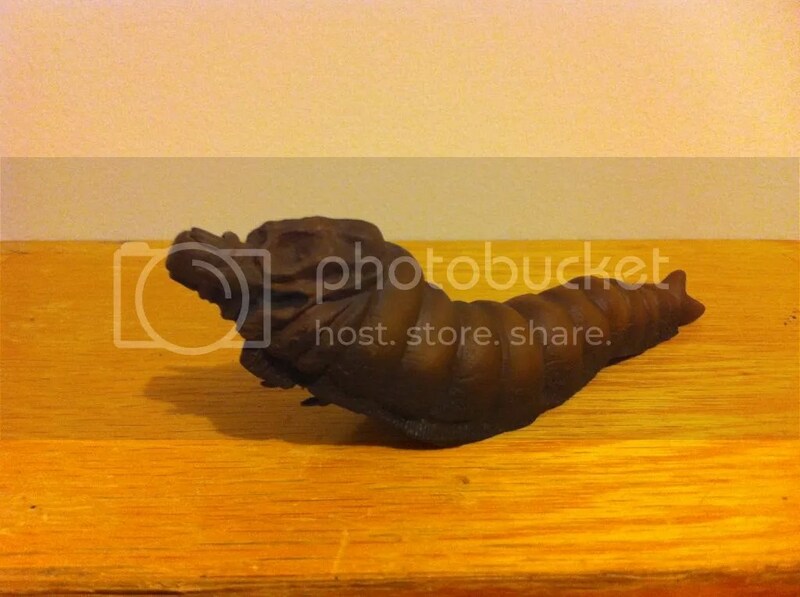 The horns on his head are curved down. 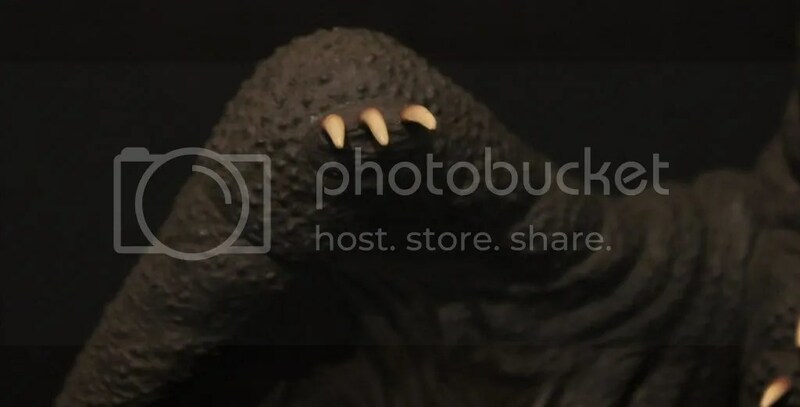 Rodan has big eye brows and puppet like eyes. 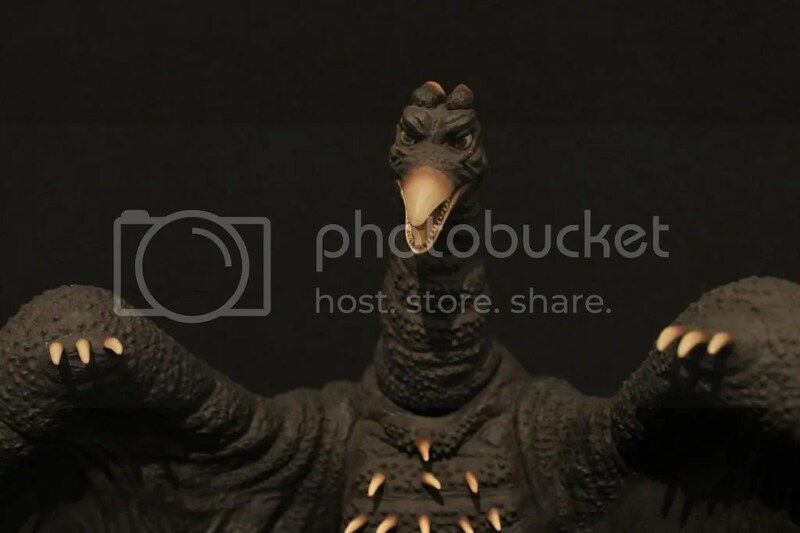 This is what most G-FANS have to come to know Rodan as which appeared in Ghidorah, the Three Headed Monster in 1964. 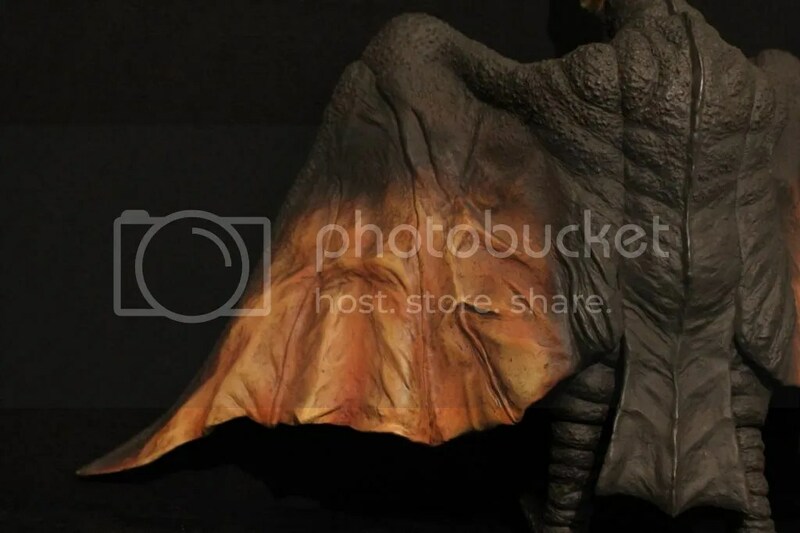 The wings are very vibrant with color and sculpted very life like. With all the wonderful freshness going on this figure does not come without its faults. 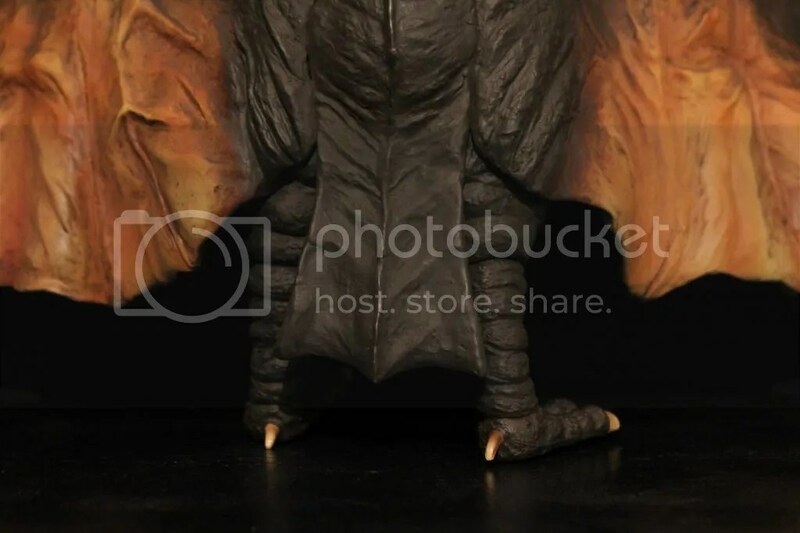 Rodan has a serious standing problem. Its like he gets drunk after a while. We will heavily touch on this later. BAM! The face which you see below is just comical. It is meant to be light hearted and more friendly. 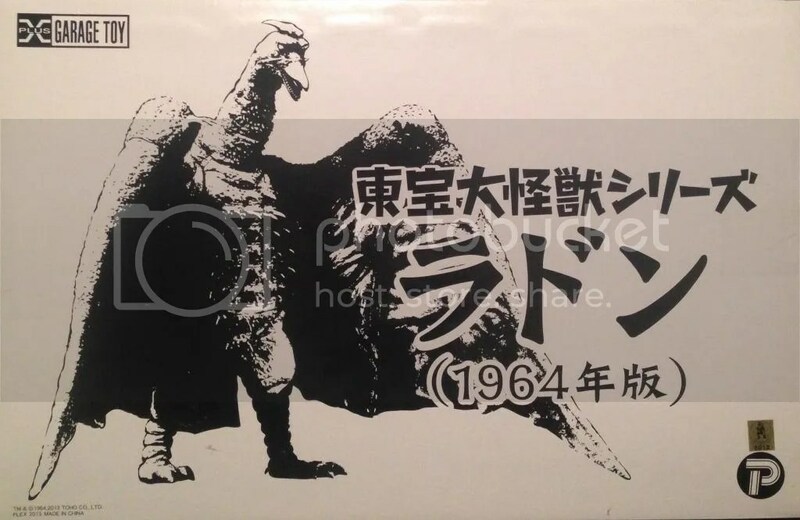 The look of Rodan definitely fits in with the direction Toho was going with their Godzilla films. Toho was going for a bit more friendly for kids while at the same time, holding its appeal to all audiences within the Kaiju genre. I really dig his eyes. The eyes are just beaming forward. The beak and mouth are detailed very well. The teeth are very defined and the tongue is very accurate too. One little feature I did not notice for a while is the little spikes in front of the eyes. Not really sure how I feel about them. I don’t think they are needed to help the look at all but they are there. 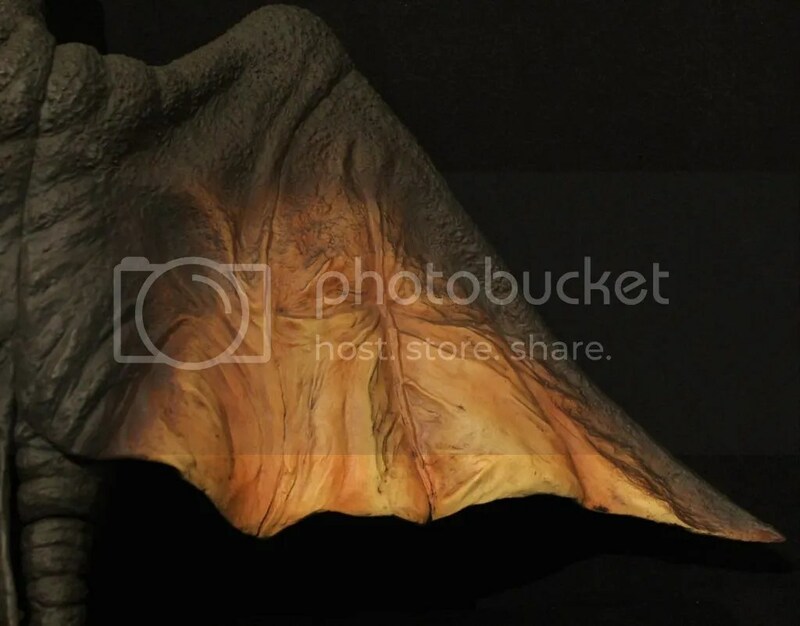 Maybe they are there as protection for Rodan’s eyes while he is flight. The wind would break around those spikes and prevent direct wind from hitting his eyes. I don’t know! The attention to detail is very apparent as X-Plus did not miss anything. The horns are don’t very accurately too. 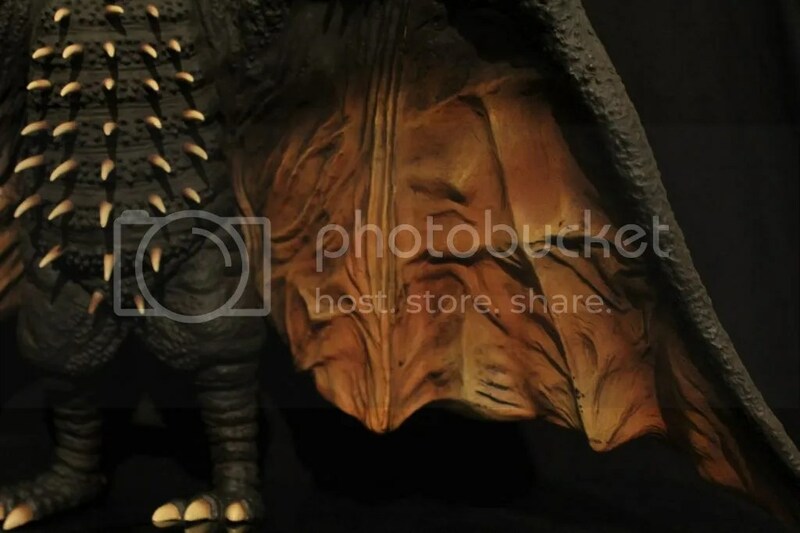 My own personal preference about the horns on Rodan’s head is that I wish they were pointed up a little more rather than curved back and down as they are. The way the horns are on the X-Plus figure are exactly how they were on the ’64 suit so they are done right. The horns are painted in a yellow bone color with brown skin tones highlighted near the base of the horns. I love the shading on the horns as they are blended very well. The wings are done very nicely. The paint job is what pops most here. There are shades of brown and tan blended very nicely together almost giving off a reddish orange look to both wings. The color of the wings really help make the figure pop. There is a lot of depth in the wings that is attributed to the paint job which is also complimented by the sculpt of the wings. There are many grooves and creases in the wings projecting a lot of depth. The wings are great looking. 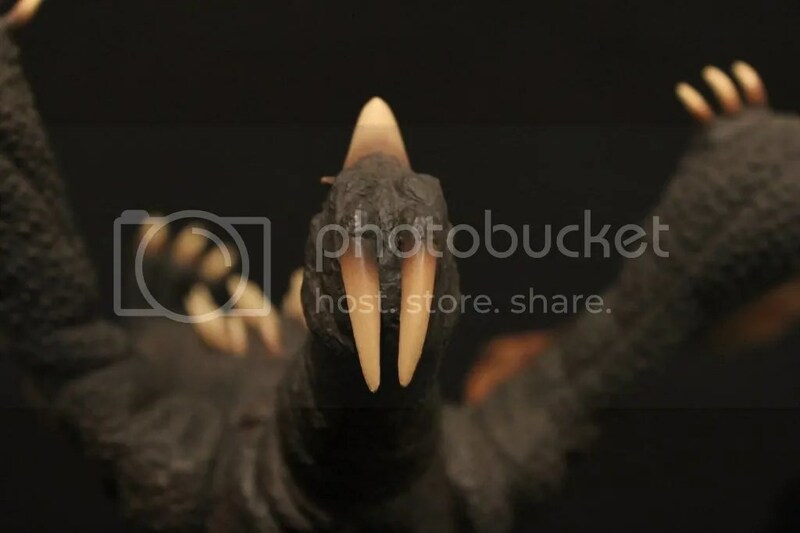 Rodan as seen from the front. The elongated neck is captured well. I have looked extra hard to see if I can see any peep holes in the neck as to where the suit actor would see out of but I did not see any resemblance that would indicate the peep holes were included. There are many bumps and scales all about the neck areas. Lots of great detail here. 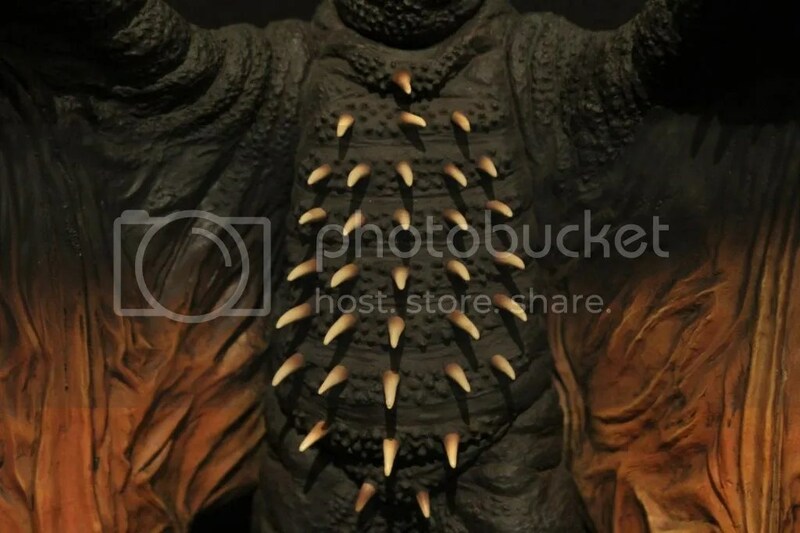 The entire chest and stomach area is well defined buy all the spikes going up and down. Yes, one of my spikes near the top is warped. 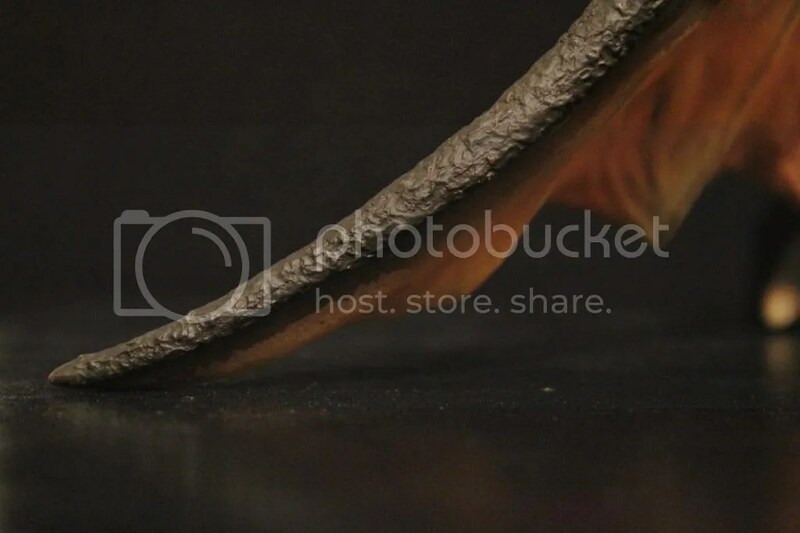 I have tried to heat up the spike and keep in position but it goes back to its warped position. Oh well! I don’t care that much. Overall, the spikes are really nice looking. The spikes are painted bone white with brown shaded highlights near the base of spike where it protrudes from the skin. Nicely done. 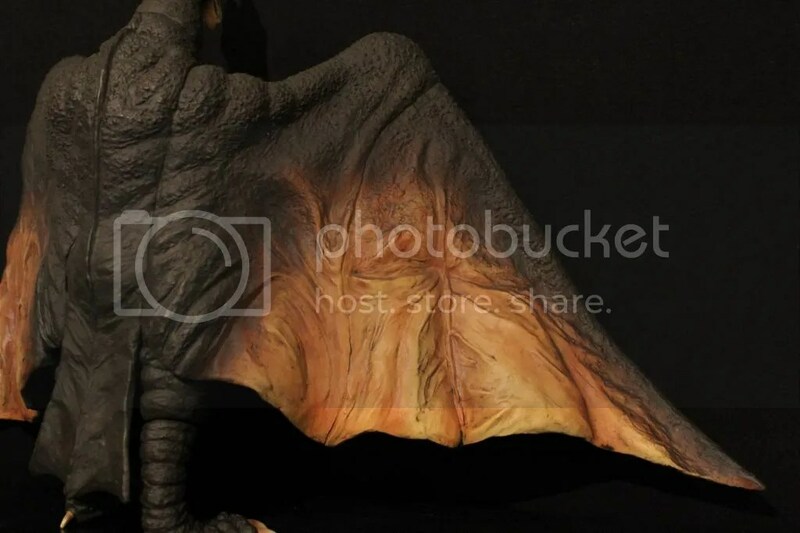 Rodan does sport mini hands on the top of the wings. They are basically just little fingers that are used to scratch and claw if needed. On the 25cm counterpart, they look as good as they can be. There is not much to them. Little nubs with claws. The claws are painted in the same fashion as the spikes on the stomach, bone white with a shade of brown at the base meeting the skin. The legs are nicely sculpted too. The feet sport 3 big toes on each with toe nails mostly bone white with a hint of yellow and then brown at the root of the nails. Nicely done. Quick note about a the little black bases you see under the foot below, those are there to counter the weight. 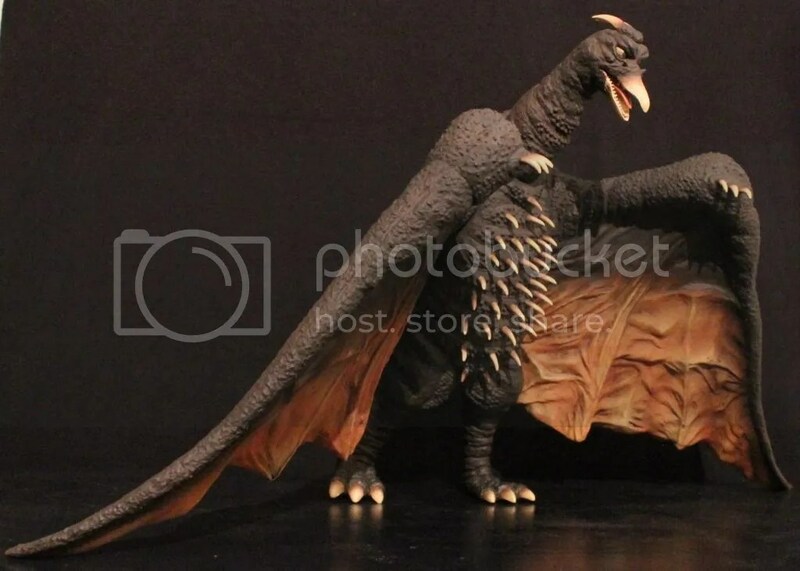 They help Rodan stand without falling over. We will discuss this shortly. 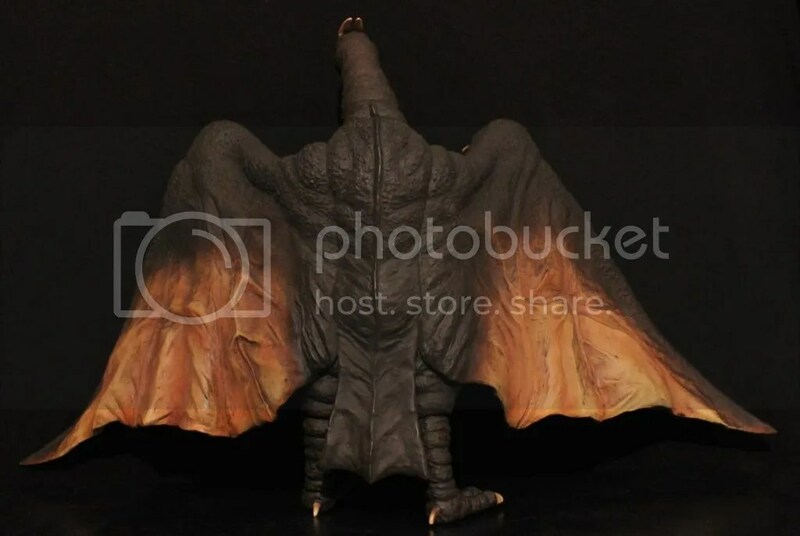 The back of Rodan is pretty easily defined here. 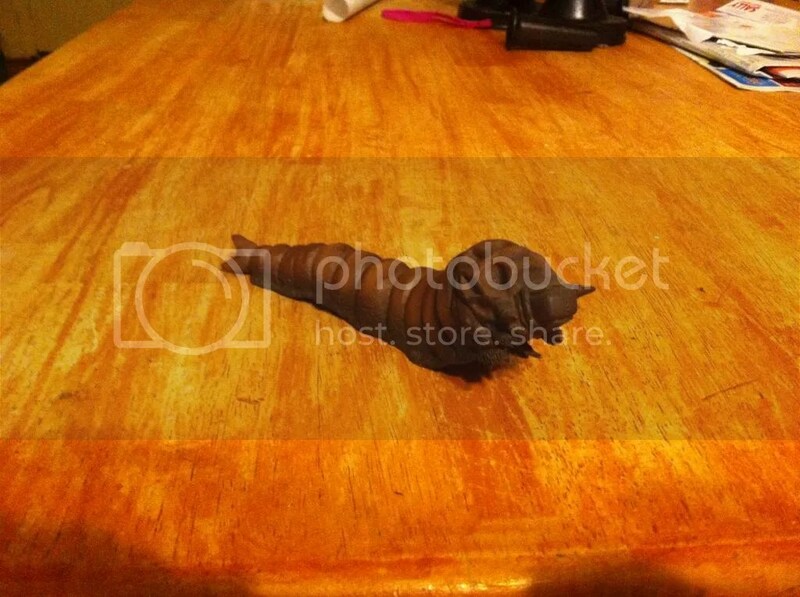 Mostly dark brown covering most of the skin from the top of the head and all the way down the back to the tail and legs. The wings are painted in the same fashion on the back as they are on the front. 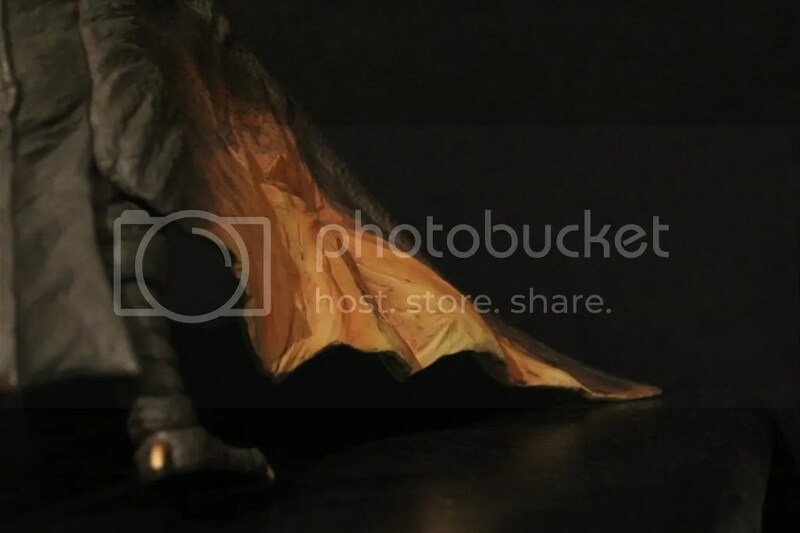 Again, the wings look really astonishing. I dig the way the wings are painted. A good accent with the tans blended with the browns. Take note, the heels also sport a little spike. Painted again in the same fashion as the spikes on the chest and stomach area. Ok, the big issues with this figure that make it very unbearable at times. 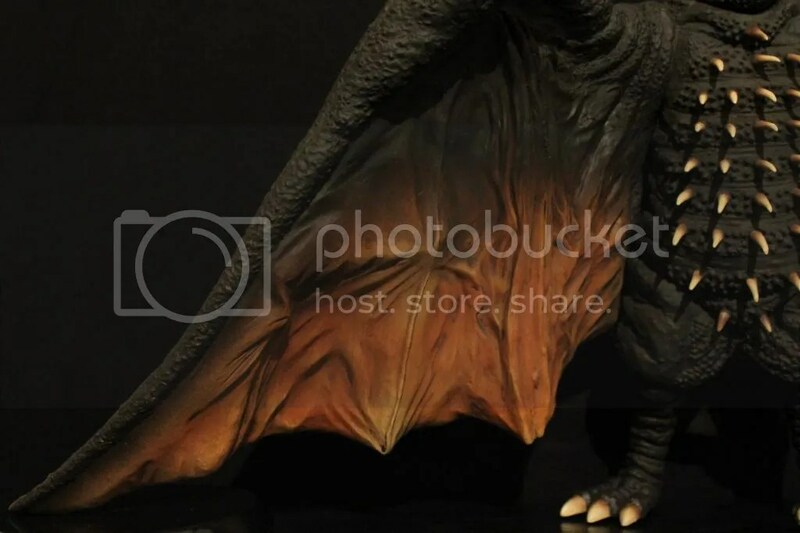 This Rodan figure faces the same issues as the ’56 25cm Rodan, warping wing tips that lead the figure to falling face first. NOT GOOD! So the main problem is warping in the wing tips. Over time, maybe a few weeks or so, the wing tips begin to bend and give. This happens because of one law. The law of gravity. Rodan obeys the law. The wing tips warp causing them to give. When the wing tips give, the weight of the rest of the figure begins to lean forward. The longer your figure maintains a somewhat stance, the worse the lean gets. Rodan will continuously lean forward until its unavoidable face plant into the shelf or worse, off the shelf and to the floor. As the lean and warping commence, the legs also give to gravity. 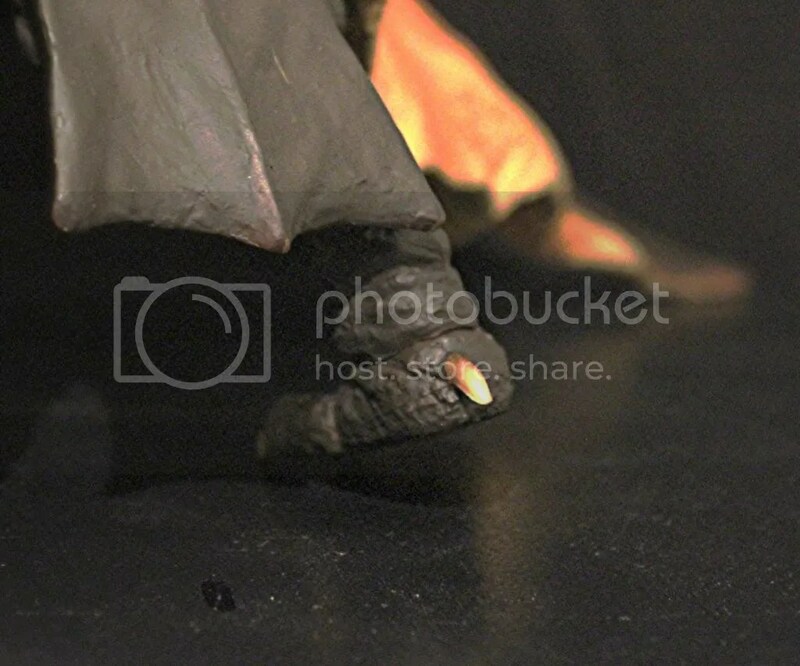 As you can see in the picture below, the foot pictured is almost completely not resting on the surface. Very horrible. The lean just gives and gives and your Rodan figure will mistake flying for falling. Complete suckage! The damage could be drastic as the beak and body spikes could sustain paint and sculpt damage if landing on a hard surface. A carpeted floor will help cushion a fall but still, this is not what we want to see happening to our Fresh Vinyl! So why does this happen? Two reasons are gravity and room temperature. Gravity says “What goes up, must come down” right? So that is one factor. The temperature in a collection room is very vital to how vinyl reacts to temp conditions. If the room is to warm, the vinyl will soften up. In this case, the wing tips are already resting on the surface of your shelf. With gravity weighing in on those points, throw in a warm room, the wing tips will warp under the weight and temp conditions. So, how do we fix this? You could heat up the wing tips super squishy soft, bend the wing tips in and forward then hit the wing tips with cold water. This will help maintain an upright stance for a short while but the wings will remember their original form and go back to warping again. I have tried that method numerous times and it just does not work. The answer to my problem is some what simple: change the center of gravity. Take the weight off the wing tips. 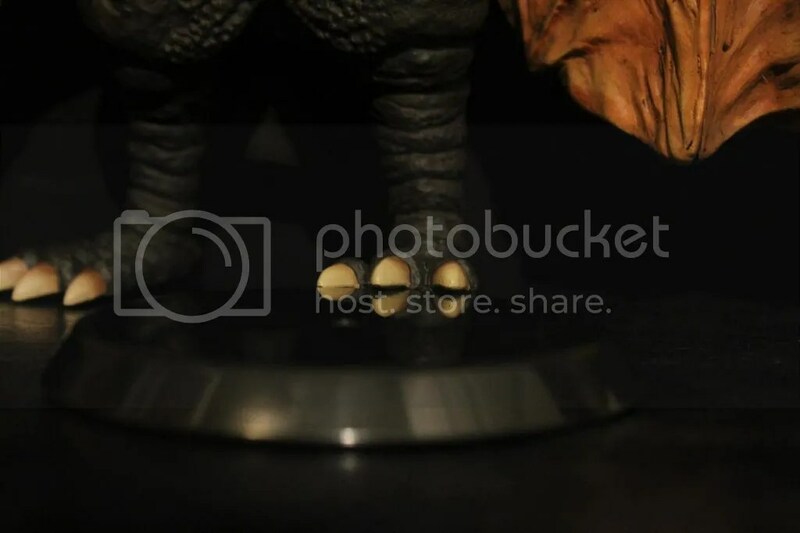 I have these little black bases that came with some other Kaiju figures that I placed under one of the feet and under the right wing tip. What this did was shift the weight of the figure off the wing tips to the back of the figure. 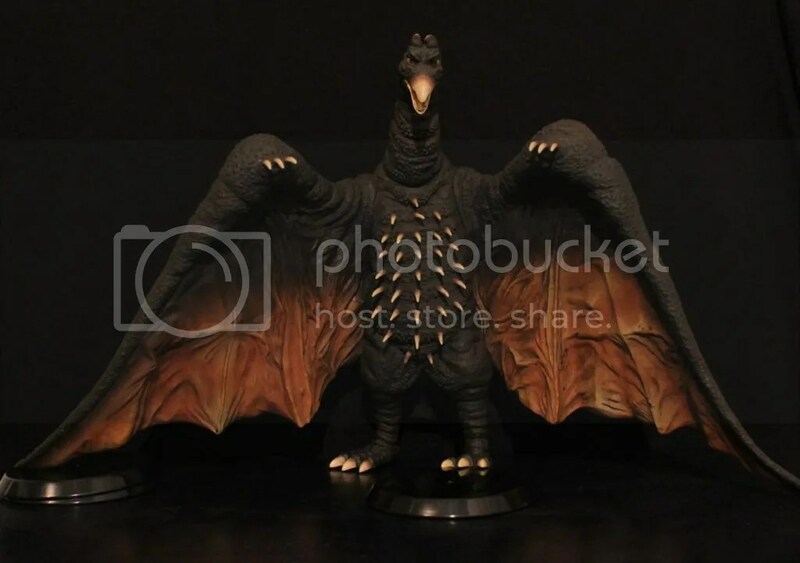 The wing tips are not carrying the weight of the figure and in turn, the wing tips are not warping and my Rodan figure is not falling down like a drunk chicken. These are the plates I am using. One under the left foot and a couple under the right wing. This method has held up since I tried it to it is my fix. I did the same thing for the 25cm ’56 Rodan. So that is my solution. If you have something similar to the plates I am using, go give it a try! Final note! 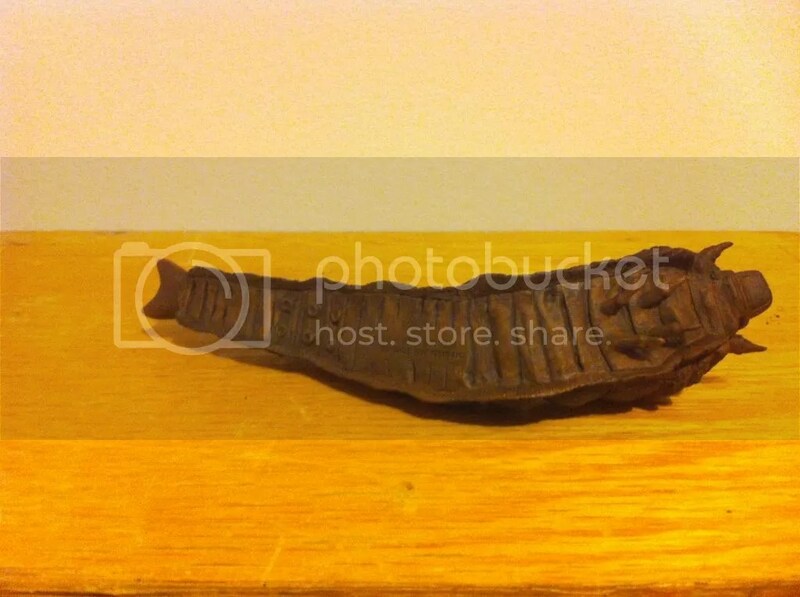 The RIC Boy Exclusive for this figure came with a mini Mothra Larva. The Mothra Larva is fashioned after the 1964 Mothra larva. 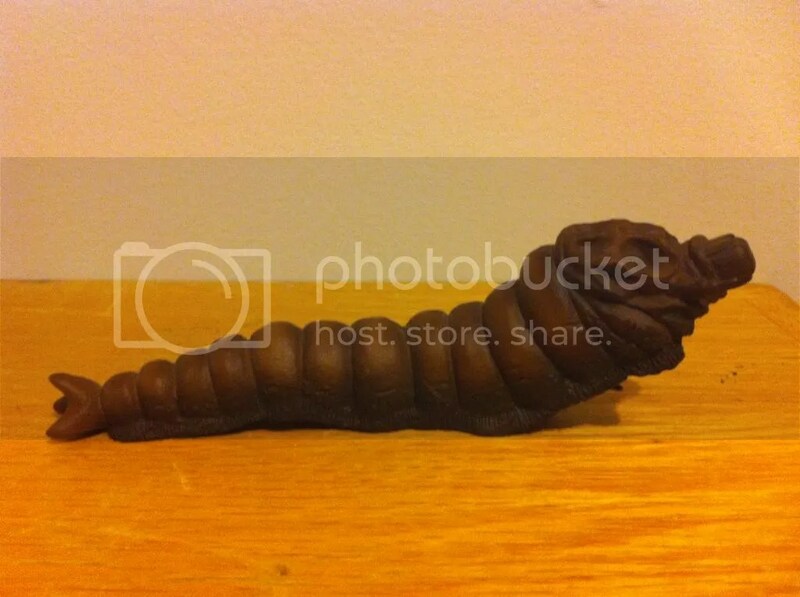 If you have seen the Mothra larva’s that came as the RIC Boy extra’s with the 25cm Godzilla ’64, this is very similar. Photos provided by Samson West! BOOYAH TO THE KING! Please check out my video review featuring special guest, Samson West! BAM!